Get great insights into the IOTA FOUNDATION, their plans & strategy - the latest technology developments - all the latest use cases of IOTA and much more. Benefit from Approved Learning Contents and become and experienced IOTA code TODAY! Save time (don't need to google content), get complete course materials, nothing is missing, Learning content always up-to-date. Course & Training tested & approved by IF. Parts of the Courses and Trainings coauthored by the IF. Personal + direct contact to trainers via messenger for 6 weeks (not available in online only course) for your questions. High learning transfer through balanced combination of theory + practice of the latest DLT Knowledge. App-based learning (beautiful learning app, offline-usage, push notification, quizzes, community, messenger, etc.) b. Editorial team support & help desk. Make friends in DLT space within the DLT & IOTA community and course participants. Exchange experiences, learn & grow. Modern didactic structure, assembled by learning pro’s. Trainings are easy to learn & become sticky, stay in your memory. Tests & practical tasks (from trainer) enrich learning experienced. Quizz battles against others strengthen skills & are fun. We're available to answer any questions you may have about the course. In the near future, many economies will be transformed through DLT (Distributed Ledger Technologies) because they are changing the way businesses operate and transact with each other. But even DLTs develop over time and new DLTs solve the short-comings of the first and second generation of linear Blockchains (low scalability, high energy consumption as well as transaction fees). 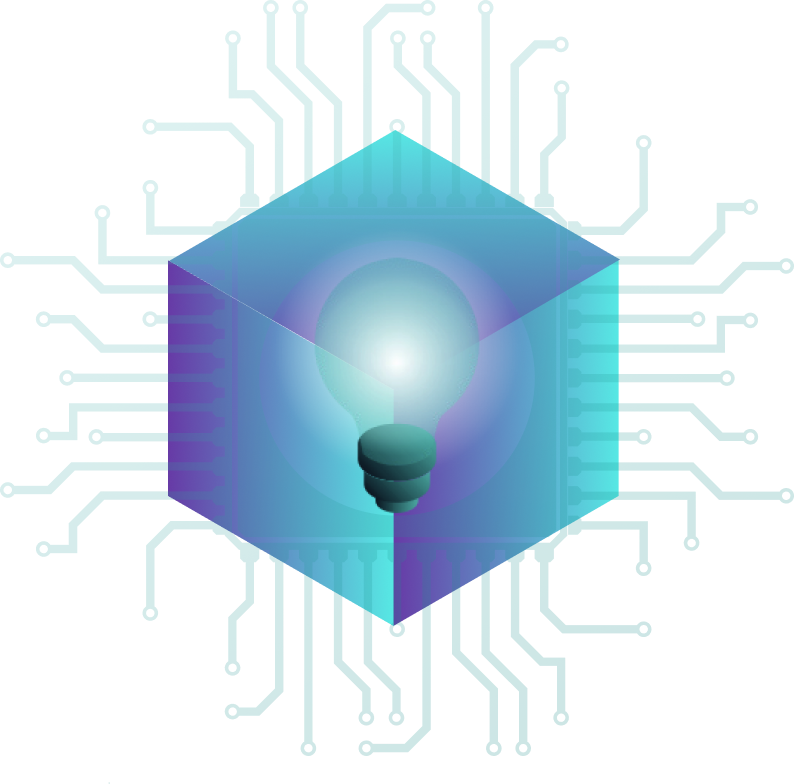 Third generation and exponential scaling DLTs like IOTA offer a Block-free , low-energy consumption, zero-fee micro transactions, democratized source of “truth” and also allow transactions with a "no single point of failure". These and other benefits enable businesses to act faster within maximum security and they also dramatically save cost in processes, which benefits the Industrial IOT (in Germany also called Internet 4.0). The IOTA Foundation (IF) works relentlessly on the future of a decentralized machine to machine (M2M) economy and offers DLT Enthusiasts as well as businesses now a new way to quickly adapt knowledge about IOTA and prepare for decentralized economies and their changing business models. In close cooperation with the IOT1 Academy, a deep tech academy located in Berlin and Shanghai, the IF has developed IOTA trainings to help developers and managers to learn and understand the IOTA Technology. All courses come with a hands-on experience and practical approach of the many use cases, the IF meanwhile provides and can be purchased here on training.iota.org. The IOT1 ACADEMY is a deep tech academy for mainly corporate education of employees in the field of Industrial Internet of Things (IIoT), also called Industry 4.0 in Germany. The digital academy supports companies in digitizing parts of their production and administration with the latest IoT-Technologies. Blockchain - especially IOTA courses of a wide range - are a strategic focus area of the IOT1 Academy since the digital age of M2M and the change coming with the Industrial Internet of Things (IIoT) is a game changer for wide parts of the industry and IOTA is best positioned for IIOT. The particularly practice-oriented, digital academy IOT1 ACADEMY therefore uses the latest didactic, app-based methods to enable particularly sustainable learning and a high level of learning transfer. Booking this certification is the first step to becoming an IOTA accredited and officially IOTA Foundation certified developer. After completing the buying process on eventbrite you will receive a link to an online assessment with a series of questions. The assessment needs to be passed in order to proceed to step 2. After passing the online assessment you will be able to select the time of your choice from a series of available meeting slots. A representative of the IOTA Foundation will send you a personal invite through google meet to the Email address with which was provided by eventbrite. It is not possible to change the email address between the first and second assessment. At the time of your choosing, the IOTA representative will go with you through the questions, follow-up on the online assessment and inquire more details about your decisions of the previous test, as well as a couple more questions to test your understanding of the IOTA technology. 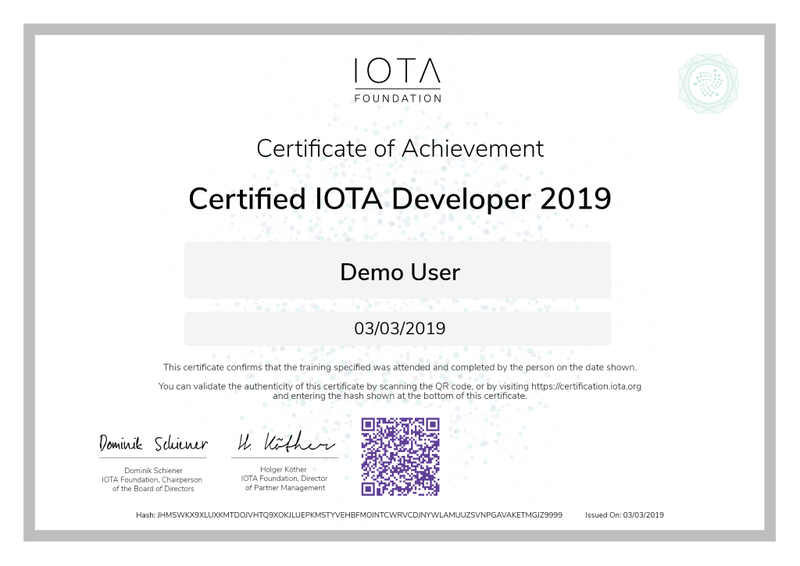 After passing both the online and personal assessments the attendee is considered a certified IOTA developer. The IOTA Foundation will issue a digital certificate to the email address provided by eventbrite. The details of the certificate will be held on the IOTA Tangle in an encrypted transaction and the validity of the certificate can be verified through the IOTA Tangle at certification.iota.org (see example below). Please test your technical setup before the personal meeting meet.google.com. A no-show >3 minutes after the planned meeting will result in a failed certification. We do offer reduced prices for students or active members of the IOTA community as well as underprivileged people. If you think you are eligible for a price reduction please write us an email to training@iota.org and we can possibly reduce the price by half. Thank you. A six week online training via the app. The participants can also choose a 3-day onsite seminar, supported bu online training & trainer support via App before and after the seminar. Group seminars and international locations can be booked on demand. Courses start normally once or twice per month and from the starting day until the end the courses last 6 weeks. Participants are free to work on their own pace though, so they can start whenever they paid. But six weeks is recommended for the best results in sustainable learning transfer because good things take time. We start in groups of 10 participants. Small groups are great to ask questions and learn from experiences.